Whether your product is in a grocery store or a retail location getting a product noticed can be extremely difficult. In the current US grocery store industry, the average number of different products is nearly 40,000 (Food Market Institute). Think about that….. How is your product possibly supposed to be seen with all of that other clutter in the store? This can be a challenge, but we have set aside a few tips. These tips have come from our 30+ years of packaging and print design experiences. 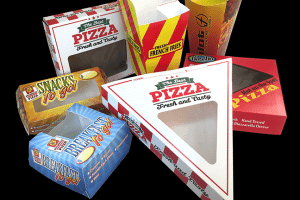 Keeping your retail packaging clear and simple is key to making your product stand out. If a consumer glances at a product and cannot decipher what it is within 4 seconds, they generally move on to an item next to it. Unfortunately, this product typically is your competitors. Oftentimes, brands are not clearly defined on a product and instead the packaging lists dozens of benefits. 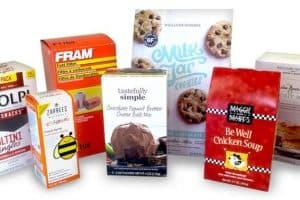 Packaging can look great, but you may have no idea what the item or food product is used for. Some products like soft drinks and perfumes can become a bit of a mystery. However, lack of brand identity and failing to identify the product use can lead to poor performance and is generally a bad practice. Creating an impact and getting consumers attention with a product can be difficult. 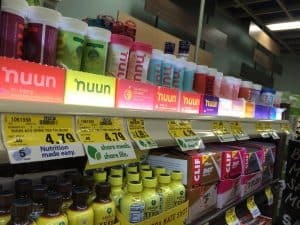 Products generally line the store shelves in rows or columns which makes the view of what consumers see a variety of patterns. So, how do we actually attract customers with different patterns? This is the million dollar question. How do we create those patterns? Creating this phenomenon that actually attracts consumers to look at your product is called “shelf impact”. Creating this shelf impact can have dramatic results in product sales. Shelf impact is something you need to test. To do this, you could take of a store shelf that has similar products to yours. Then use Photoshop or find a designer to imitate your newly created design and put it on the shelf. Some things to ask yourself when looking at the mock up: Does it look distinct? Or do you need to go back to the drawing board? The more distinct it looks, the better it will pop on the shelf. You will be surprised, but often times it is not the best design that sells. Do the homework on your competitors, do some testing and create something distinctive that will create the shelf impact. Great brands create originality, character and memorability. They set themselves apart from the rest. Creating authenticity is key. There are hundreds, even thousands of products that most product companies compete against in any given category. This makes it essential that you gain your consumers attention. It is nearly impossible to tell a brand what will work and what will not. It is a matter of testing and continuing to test until you find something that works. Think about designs in an uncommon way with strong visual standards. What are all your competitors doing? Do something different. Is everyone writing horizontally? Change it up and make your text run vertically. Take that leap of faith, become brave and bold, create something new and intrinsic. You never know what will work well until it happens. 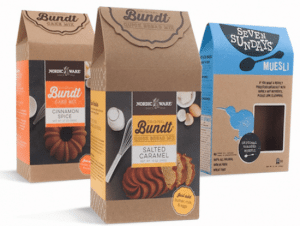 The packaging industry isn’t going anywhere soon and the demand for design continues to stay strong. Our expert package designers, with 30+ years of experience, have been able to deliver authentic, quality and packaging that sells time and time again. If you are looking to create some new package designs for your product. Please reach out to us here or call 1800-967-1705.